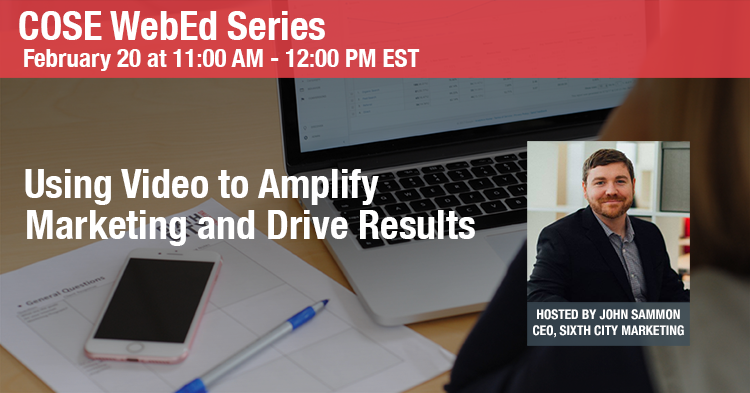 Sixth City Marketing CEO John Sammon will host a webinar to discuss how utilizing video in marketing can help businesses yield results on Wednesday, February 20, 2019 at 11 a.m. to 12 p.m. EST. The webinar is part of the Greater Cleveland Partnership’s Council of Smaller Enterprises’s (COSE) WebEd Series, a webinar series designed to help small businesses throughout northeast Ohio to grow and succeed. Why video? Video has become an important tool for marketers and businesses throughout a variety of industries. And the ubiquity of smart phones and other devices means video will only continue to be essential well into the future. In this webinar, Sammon, who has more than fifteen years of experience in digital marketing, will discuss how small companies can use video to their advantage and help reach their business goals. If you have any questions before or after the webinar, feel free to contact John via the Sixth City Marketing website.